But I'd like to speak of my Victory Garden. I ventured forth to become a farmer. A figure than which there was none more dramatic-er. But nothing turned out the way it shudda. Would you like a description of my parsley? I can give it to you in one word--gharsley! I planted birdseed--it came up parrots. Whenever I think of my Victory Garden? So don't ask me to tell a string bean from a soy bean. I can't even tell a girl bean from a boy bean. Nash's contrarian view of gardening for victory was printed in House and Garden magazine in November, 1943. That year,20 million home gardens produced over 80 million tons of food; about 40% of the vegetable consumption of the US. Impressive, but this was my grandparents era and they grew all their vegetables at home anyway, Victory or not. So I've always wondered about these statistics. The DC comic book in which Superman, Batman, and Robin labor in a Victory Garden was released around the same time, in September of 1943. I've only been able to locate the cover...if you know the inside story of why exactly these superheroes have found themselves toiling in the garden (to defeat the dark powers of eggplant, perhaps?) do get in touch. good post. I love the poem as it really sums up why I gave up veg growing albeit last year! I like your line about your grandparents grew all of their own vegetables anyway. Mine did also, and I've always wondered about those numbers. Wonderful post. 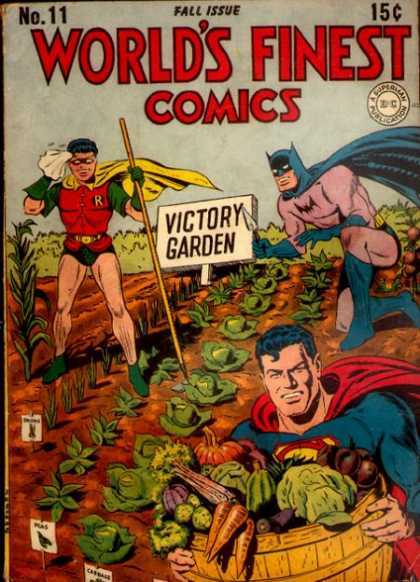 Batman, Robin, and Superman are examples to their kid readers during WWII about how important Victory Gardens are to the war effort. In the 1940's and 50's, comic book covers often had nothing to do with the stories inside. The World's Finest comic featured stories with Superman, with Batman and Robin, and with other characters,but they didn't appear together. However, for marketing purposes, they often showed both Superman and Batman on the cover. During World War II, the covers were frequently used to promote patriotic themes, including ideas like the Victory Garden, War Bonds, scrap drives, gas stamp usage, air raid drills, etc. This is a great example of that type of cover.